dňa: 16. 6. 2017 od 8.00 – do19.00 hod. Záväzná prihláška a podrobný program zde: 2017_konferencia, 2017_konferencia_EN. 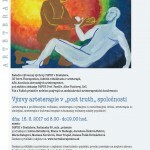 Záväznú prihlášku a potvrdenie o zaplatení účastníckeho poplatku prosím posielajte na mejlovú adresu: konferencia.arteterapia@gmail.com do 31. 5. 2017. Súčasťou konferencie bude výstava prác študentov arteterapie vo foyer fakulty. This conference continues the exploration of contemporary art therapy practice initiated in our first conference here at Goldsmiths in 2013. 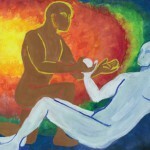 Art therapists are of necessity engaged in making spaces, creating both physical and imagined spaces. Finding places relates to both the physical setting and the place of the art therapist in organisations where they work. We are wanting delegates to bring their own questions and insights in relation to space in art therapy to the conference, finding a place there for discussion and exploration, in workshops and in paper and panel presentations. 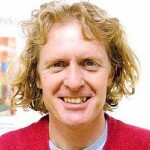 This year’s key note speakers are Grayson Perry (picture right) and Patrick Casement. Morning panel speakers are Haley Bermna, Chris Wood, Patricia Fenner, Fausto Sergej Sommer, Penelope Best and Sally Skaife. Visit ATOL Art Therapy OnLine Vol 5 Issue 1 to explore the work of our previous conference. Please email arttherapyconference2016 (@gold.ac.uk). Further information will be fortcoming in the near future.